Smash Bros has had a lot of support since it's initial release with 4 extra characters and stages both new and old brought into the mix, so what's new in the latest update? Toon Link fans should be happy as the Pirate Ship stage from Smash Bros Brawl makes a return exclusively to the Wii U version of Smash. Set on the oceans of Zelda the Wind Waker, the stage switches between sailing on a boat and docking against a sizeable rock island. 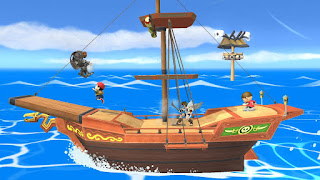 Platforms in the background also interact with the main ship by firing canons at random fighters, and you may notice a few familiar faces sailing by on the horizon. There's also a bunch of new songs available to add to the Zelda selection of music, including Dragon Roost Island and The Great Sea theme. Hoist the main sails ya swabbies! 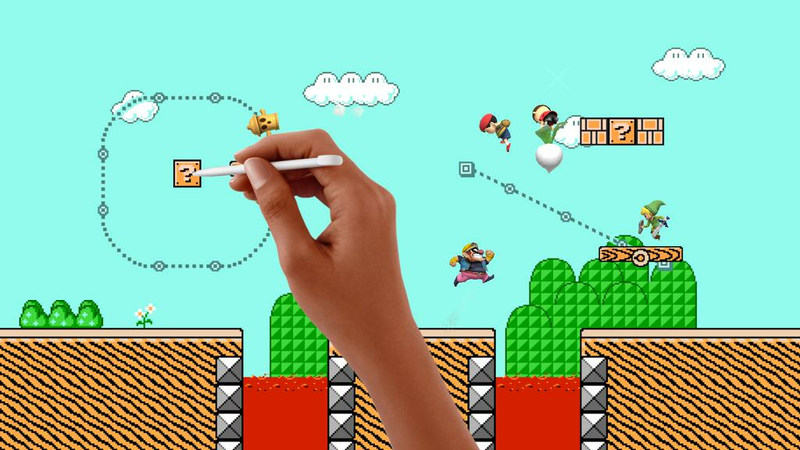 Super Mario Maker just hit Wii U and to celebrate there's a new stage for Smash themed after this new title. The stage seems to be a bit random with it's layout at the start of a game, it's been different every time I've played on it. Any blocks that can be broken in a Mario title can also be smashed here which can create holes in the ground for you to fall through so be wary about where you do your ground smashes! The floors get repaired as the match goes on by the giant hand you can see below, sometimes it's a cat paw that fixes things up which is kind of random but just go with it. The design of the stages also switches between the 4 different versions of Mario game worlds that appear in Super Mario Maker with music to complement. GET YOUR HAND OUT THE WAY! This stage is a 3DS exclusive and is totally free! Once you download the latest update, you'll find this stage readily available in the extra stage selection. 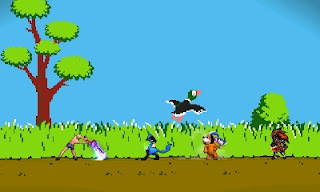 Just like the original Duck Hunt on the NES, the bushes in the background have ducks flying out of the grassy fields, if you manage to knock them out of the skies the Dog will even pop up and show you your catch! What happens if you manage to knock them all out? Mii Fighters have also had a whole mess of customisation options if you fancy dropping a pound or two on each them. This time around we have the Fox outfit from StarFox for the Gunner class, Swordfighters are represented by Viridi from Kid Icarus and the amazing Monster Hunter Rathalos and Blademaster armour sets. The reason I love these so much is because you actually get two sets in one as both male and female Mii Fighters have their own special designs similar to how it works in the actual Monster Hunter games, plus they look incredible. Brawlers get a Toad makeover, a Captain Falcon outfit and there's also the Business Suit available for every class so plenty of options if you're into using Mii Fighters. Check out the video below to have a peek at whats in store.